If you don’t have the patience to play through the original Prince of Persia perhaps you should just cheat? 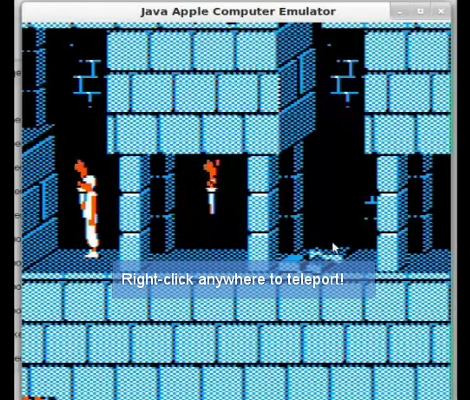 [BLuRry] has made this easy for us, by building Prince of Persia cheats into JACE, the Java Apple Computer Emulator. He shows off the emulator and the cheats he added in the video after the break. We saw the ability to teleport anywhere, kill enemies immediately, and open gates and exits. All of this happens with the click of a mouse. But there’s also a configuration screen used to enable the cheats that offers a handful of other cheat options that weren’t original to the game. [BLuRry] managed to roll these cheats into the emulator after some thoughtful study of the original source code which [Jordan Mechner] recently released after the once-lost floppy discs storing the ancient digital gem were discovered. You know, we always see people running doom on various types of hardware. Maybe we should start using PoP as our go-to novelty game? A fun thing to try: Wait for the credits and opening to finish and the game will start a demo level. The mouse cheats will ALSO work there, so you can kill the enemy in the demo or kill the prince by teleporting him over a gap. Feather fall is pretty fun, too. The more interest aspect of feather fall is that you could take it one step further: Prince of Portals, anyone?? the game have cheats i have play it at the time on a old dos pc by type prinsmegahit or so you can skip levels or kill by press k and the pepole drop dead. Ferdie, a good point. The cheats available vary by platform though. The apple version only lets you skip up to level 4. The PC cheats in the “megahit” version are far more extensive. However, the mouse-based cheats add a new dimension since I’m moving the prince around and opening gates. This can be an additive experience if you’re trying to play the game “normally” but get stuck or frustrated by some of the trickier puzzles.